Choose 'Tables & Financials' in the content library to pick from a range of predefined data tables and financial statements. Use the 'columns' and 'rows' filter to quickly find your desired layout. You can then easily customise your financial statements to show the most relevant information. 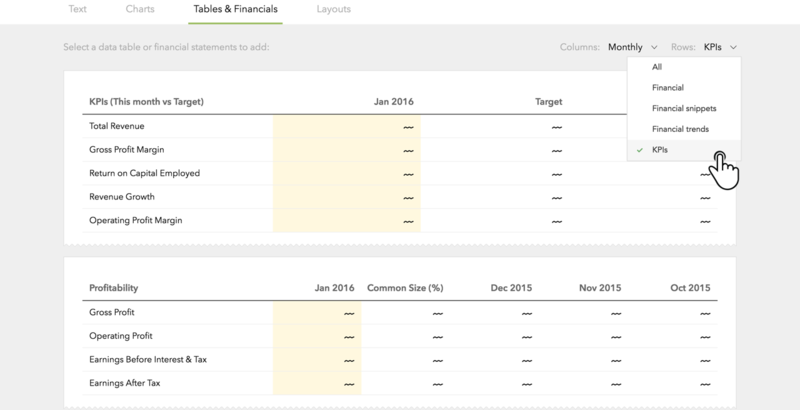 Drag and drop the columns in the properties panel, to change the layout of your financial statements. 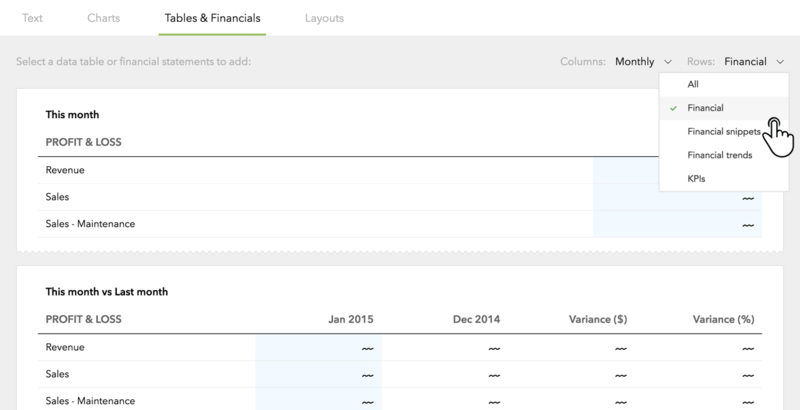 Click the 'add a column' button to add a new column of data in your financials. You can have up to 6 columns in a table. Under the 'Rows' tab, you can choose to display the Profit & Loss and Balance Sheet in varying levels of detail using the detail slider bar. The level of detail you select will summarise the data into headings and subheadings, based on the structure of your Chart of Accounts from Step 3. A financial snippet allows you to select any account classification and analyse this in summary form. For example, Revenue, COS or Expense accounts. Tip: you can include a forward projection (budget + actual) and a rolling 12 months column under the 'Other' category in the variable selector. Data tables allow you to create customised tables of key numbers. These can include both non-financial and financial KPIs. Data tables could be used to show a summary of key numbers, and their performance against target (or budget) for a period. Select 'KPIs' from the category drop-down in the content library. Hover over the table to edit both the columns and rows. Rows can include KPIs, summary Profit & Loss and Balance Sheet items, or any item from the source Chart of Accounts. 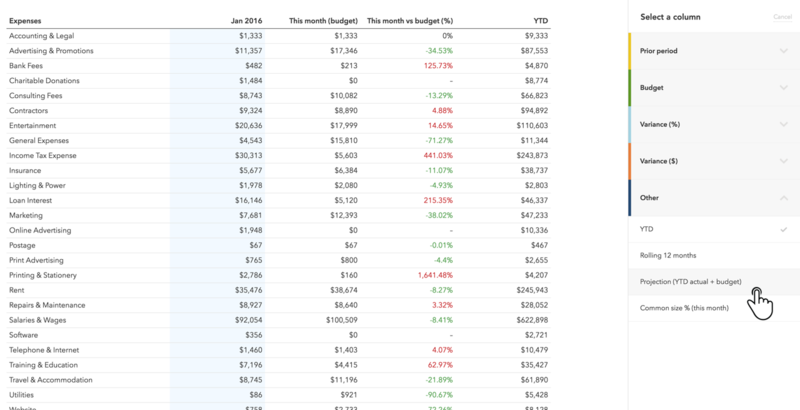 Columns can include a prior period comparative, budget (or target) or a variance against budget.